This lesson describes how to indicate need for additional evaluation, add evaluation areas and evaluators, indicate parent/guardian notice and consent, and log attempts made to contact parents. This lesson also requires that a referral has been created for the selected student. For information on how to create a referral, see the "Add a Referral (REED)" lesson in this manual. Under the Process sub-navigation tab, click Referral (REED). 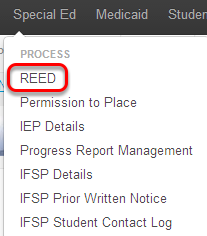 Click Edit to open the REED for your selected student. Click the Plan tab in the Sub-navigation Toolbar. Option 1. 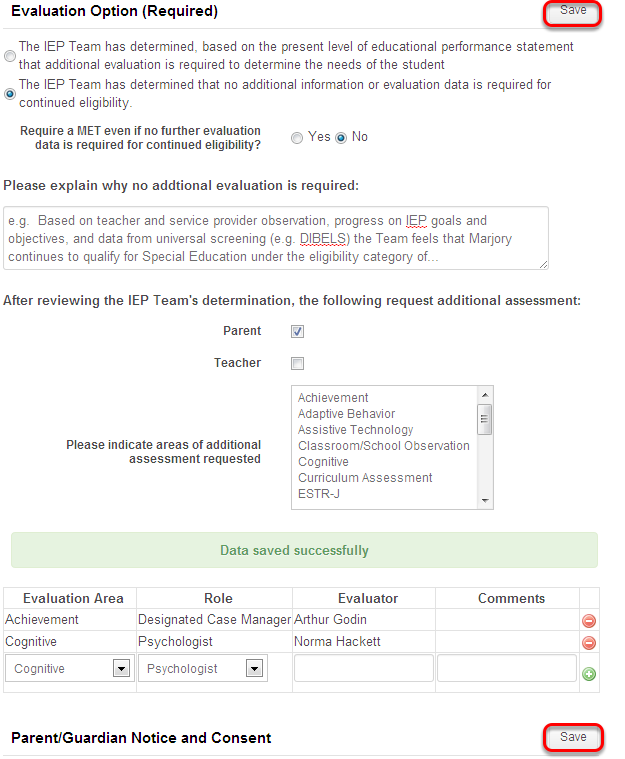 Select "The IEP Team has determined, based on the present level of educational performance statement that additional evaluation is required to determine the needs of the student" and a form will automatically load below titled "Determination Options" where determination options, evaluation area, and evaluator information will be entered. Option 2. Select "The IEP Team has determined that no additional information or evaluation data is required for continued eligibility". This will require an explanation of why no additional data is needed and provide options for additional assessment that may be requested by the student's parents or teacher. The following steps apply when "The IEP Team has determined, based on the present level of educational performance statement that additional evaluation is required to determine the needs of the student" has been selected. Answer Yes or No as appropriate to indicate how data from the evaluation will be used. 1. Select the Evaluation Area from the drop down provided. 2. Select the Role of the evaluator from the drop down provided. 3. Enter the evaluator's name in the Evaluator field. You may enter just a few letters of the evaluator's name and a drop down list with the available evaluator's names will appear. Once you have located the evaluator's name roll over his/her name and click. 4. Enter any comments in the text area provided. 5. Click the Green Add Icon to save this record to the plan. Repeat Steps 1-5 until all evaluation areas and evaluators are included. 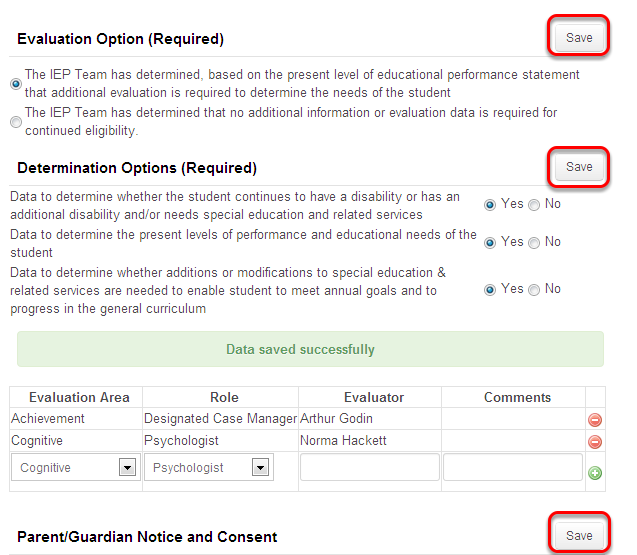 Note: You MUST click the Green Add Icon before you Save your plan information or the evaluator WILL NOT be added. Upon successful addition of an Evaluator a green box indicating Data saved successfully will appear. Note: Clicking the Red Minus Icon allows you to remove an evaluator. Use the check boxes provided to select all that apply in accordance with this plan. 1. Use the date picker to select the date the contact attempt was made. 3. Enter the user's name that made the contact attempt. Remember that it must be a user in the system. 4. Enter any information about the contact attempt in the comments box provided. 5. Click the Green Plus Icon to add the contact attempt to this page. Click the Red Minus Icon to remove contact attempts. Repeat Steps 1-5 to add additional attempts to contact parents. After all Plan information has been added, click any of the Save buttons to save the Plan. Note: Review the plan to ensure that all information is correct. If all information is correct, proceed to "Next Steps" at the end of this lesson. The following steps apply when "The IEP Team has determined that no additional information or evaluation data is required for continued eligibility" has been selected. 1. Indicate whether a MET is required for continued eligibility by selecting Yes or No. 2. Provide a detailed explanation of why no additional data is required to continue the student's current eligibility in the field provided. 1. Indicate whether Parent or Teacher are requesting additional assessment data by clicking the respective check box. 2. Select areas of additional assessment requested. Hold the Ctrl key (PC) or the Command key (MAC) to select multiple areas for assessment. Note: To remove a selected assessment, hold the Ctrl key (PC) or the Command key (MAC) and click on the assessment to be removed. 2. Enter the method in which the attempt was made (i,e., Phone Call, Email, Letter). Note: Review the plan to ensure that all information is correct. If all information is correct, proceed to "Next Steps." 1. Upon successful save, a green box indicating Data saved successfully will appear. 2. After you are finished creating the plan you are ready to move on to Key Dates. To proceed, click on the Key Dates tab in the Sub-navigation Toolbar. Note: Please refer to the "Enter Key Dates for a Referral (REED)" section in the "Referral (REED)" manual for more information on how to input Key Dates.